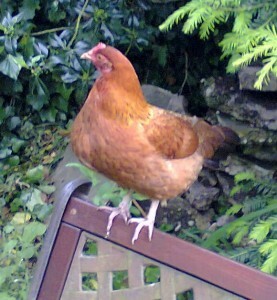 I’m afraid that Pavlova the chicken is on the naughty perch at the moment and can’t come out to play. All the attention and fan mail she received after last month’s blog post went straight to her comb and she’s behaving disgracefully. A real poultry diva, in fact. She’s been horribly mean to birds that she deems inferior, has been strutting her stuff like she owns the place and making such a noise, Tim Peake can probably hear her up in his space station. But worst of all, she’s taken to leaving very large deposits right outside the back door. Eeew! That’s it – I’m withdrawing the oxygen of publicity that she craves even more than her dried meal worms, and whether this is a permanent or temporary measure depends entirely upon her behaviour in the immediate future. She can put that in her beak and smoke it. Pavlova is in the hen house. Oh yes, I took a short break recently to meet up with an old friend. About a hundred years ago, I used to share a flat in Kew Gardens with someone I will refer to only as M, to protect the guilty. 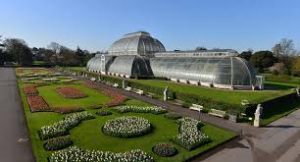 In case you were wondering, Kew Gardens is a place (now referred to as a village by those fortunate enough to be able to afford the zillion pound price tags of property there) in West London and not just the hallowed centre of horticultural excellence – ergo, we didn’t actually live in a potting shed. There was another girl too – Valerie, but M and I knew each other from ghastly temp jobs we had with British Gas and Valerie was a bit of an also-ran. I wonder whatever happened to her – she was something of a miserable cow (turned her nose up at the rot-gut sherry we used to drink by the bottle, I can’t imagine why) and totally lacked any sense of humour as I recall. Some sort of local government worker, I think, which could explain the comedic bypass. On Friday evenings M and I used to frequent the local wine bar, run by a rather brassy dame in her forties (she seemed ancient to us then!) who had very amusing affectations, airs and graces, until she’d had one too many glasses – which she did frequently – then all hell let loose and dancing on the tables ensued. Not a pretty sight, as she was a rather large lady, who either didn’t believe in or chose not to invest in controlling underwear. Brassy wasn’t the only entertainment to be had chez Garfield’s – a guy used to sing and play acoustic guitar (both badly), expecting punters to buy him copious amounts of alcohol to keep his tonsils irrigated. It was actually worth buying him a glass or two for the bliss of silence during the (all too short) time it took him to neck the booze. Kew is within a long stone’s throw of Richmond upon Thames, just two stops on the Tube – where we could have had a much wider choice of great venues to sup the vino, most with some form of decent live music, but there’s a lot to be said for being a short walk from home when the time comes to stagger out the door of a hostelry, especially in Winter. Besides, I always suspected that M used to fancy the singer and that terribly attractive aggressive snarl he shared, if nobody applauded his questionable vocal efforts. I was at the flat for only a short time before I got a proper job and moved in not a million miles away with the OH. Valerie and M let my vacant room to a rather dishy Australian guy – and were both bitterly disappointed when they found out he was gay. Unfortunately, he repaid their hospitality by hightailing it back to Oz less than three months later – perhaps he suddenly remembered where he’d left his didgeridoo. M’s life and mine took very different directions; over the years, I produced a few sprogs and we moved the family to a falling-down house in Norfolk. M visited as frequently as she could and, child duties permitting, I went to see her for some very welcome R&R. Wine was drunk. In abundance. She neither married nor had children – perhaps being the oldest of six had put her off – and eventually moved back to Scotland, from whence she hailed. The visits in both directions became less frequent because of the sheer distance involved and the responsibilities that life throws at us – it didn’t help that the OH would spend long periods working overseas, leaving me in sole charge of four smelly boys. But children grow more independent with age and gradually they were no longer tied to my apron strings, so a new period evolved in the social lives of M and me. For several years, we have been meeting up intermittently in a variety of UK locations (let’s hear it for bargain air fares and cheap deals on train fares!) – for instance, Edinburgh, Dublin and Newcastle, the latter where we took in the most excruciating ‘Emperor’s New Clothes’ art exhibition (for want of a better description!) at the Baltic Centre. Well I say ‘took in’, but M stomped off in her size eight Doc Martens after about ten seconds – mumbling obscenities – to stick needles in her eyes. But was it art? Actually, no. A bit of a turkey is the kindest description I can manage – but I suppose you have to admire the exhibitor’s nerve. Plus, it was a few years ago now and I can still recall its sheer ghastliness in some detail (I didn’t have M’s nerve to exit, stage left, in a flurry of outrage at the flagrant waste of tax payers’ moolah, and persevered) so it did make an impression of sorts. We met again most recently in Cambridge – I am now granny to six and M has a huge number of nephews, plus just one niece, so two old ladies sitting in deckchairs, to paraphrase Morecambe and Wise. J She took (very!) early retirement and is travelling a lot, so I was lucky she could fit me in! In all likelihood we will never again Run the World with Bob Geldof (though I’m not sure that he actually ran the first time! ), or go on severely bracing hikes here, there and everywhere – or indeed puff, pant and wheeze our way to the top of Arthur’s Seat. That always sounds faintly rude, somehow. I did draw the line, though, at accompanying M to a Wham concert – she bought herself the most awful bright blue synthetic cap thing with ‘George’ plastered all over it, and actually wore it there and back on public transport! Our main exercise now when we are face to face is talking, catching up generally – and, of course, drinking wine, though not so much as we used to as we’re older and so much wiser. Yeah right! 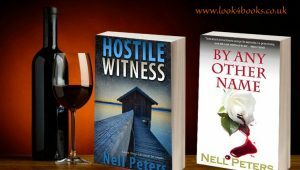 Just to prove what a wino I am (it was M’s fault – she led me astray), even my two crime novels published by Accent Press are drawn to the bottle. Another wonderful blog!! Many thanks Nell! I shall be raising my coffee up to you on 13th July. Those must have been some serious drinking sessions if you lived in Kew and thought it was two stops from Richmond on the tube. Maybe the times you tried it you saw every stop twice.